PolitiFact can't handle the truth about its "Lie of the Year"
Last week, we unveiled our 2013 Lie of the Year, President Barack Obama’s statement, "if you like your health care plan, you can keep it," making the announcement live on CNN’s The Lead with Jake Tapper and simultaneously publishing an in-depth story on our website. Either it's a half-truth or else Angie Drobnic Holan lied to CBS' Jake Tapper when she said "They're both the lie of the year," referring to a different claim from President Obama that PolitiFact rated "Pants on Fire" in 2013. Half true, as PolitiFact describes it, means "the statement is partially accurate but leaves out important details or takes things out of context." Forgetting to mention the co-winner of the award would appear to count as an important detail. It's delicious hypocrisy from fact-checking's weakest link. This year's "Lie of the Year" was all about covering PolitiFact's arse as it failed to adequately cover President Obama's inaccurate speech about the Affordable Care Act. We had defenders on Twitter, too, like David Podhaskie, a legal editor. 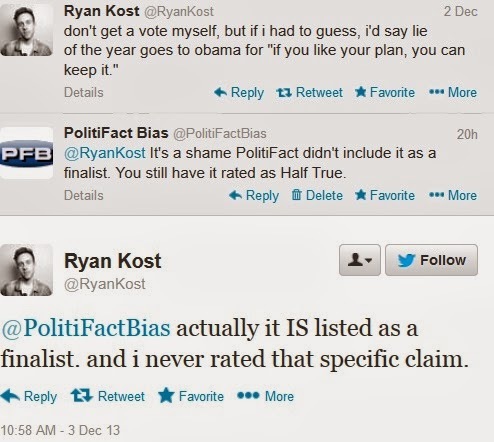 "Maybe people are getting mad at @Politifact because they haven't actually read their entries on Obamacare?" He linked to a few. "If a fact-checking site is making both sides mad, it's doing its job." Kind of like John Beale was doing his job if both Democrats and Republicans are outraged at the way he defrauded the EPA and the American people. Isn't it past time to retire that lamest of defenses? Conservatives and liberals have the same legitimate complaint about PolitiFact: It's inconsistent with its past practices to name a "Half True" statement as its "Lie of the Year." Beyond that, conservatives think the "Half True" rating was too kind while liberals think a "Half True" statement shouldn't be eligible for the award. The criticism from both sides means PolitiFact isn't doing its job. The unusual way a "Half True" statement qualified as a "Lie of the Year" deserved a full and complete explanation from PolitiFact. We're not getting one because PolitiFact is succeeding with the deception it intended for this year's "Lie of the Year." *The fact that we warranted no mention in that article shows clearly we should have worked a cabal of fascist cannibalistic lesbian spies into our PolitiFact Lie-of-the-Year conspiracy article. Hot Air: "Congratulations, Barack Obama, on winning PolitiFact’s 'Lie of the Year'!" We're not much for using PolitiFact as evidence for much of anything, but Allahpundit's "Lie of the Year" article for Hot Air avoids some of the missteps we're seeing from other conservative voices. And yet, as Sean Higgins noted last month, the hacks at PolitiFact backed Obama up on it in whole or in part no fewer than six times between 2008 and 2012. Last year, in the thick of the presidential campaign, O actually had the balls to say, “If you’re one of the more than 250 million Americans who already have health insurance, you will keep your health insurance.” That’s even more categorical than his infamous phrasing at the AMA conference in 2009. PolitiFact’s rating: Half-true. We do wish commentators like Allahpundit were more clear on the point that PolitiFact is not budging from its "Half True" rating of "If you like it" despite the LOTY award. PolitiFact is using a different and later claim from Obama as a shoehorn to help squeeze "If you like it" in as the winner. 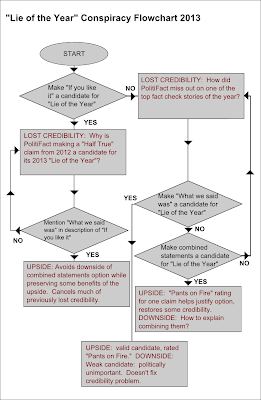 As PolitiFact editor Angie Drobnic Holan explained, "They're both the Lie of the Year." Red Alert Politics: "PolitiFact attempts to downplay “If you like your health care plan, you can keep it” falsehood even while dubbing it ‘Lie of the Year’"
How can we not like a "Lie of the Year" blog post that dovetails with our own painstaking analysis? In both 2009 and 2012, the website gave the President’s ‘if you like it, you can keep it’ assertions “half-true” ratings. But in its “Lie of the Year” designation, PolitiFact still claimed the President was simply using “a catchy political pitch and a chance to calm nerves about his dramatic and complicated plan to bring historic change to America’s health insurance system” — instead of outright lying to achieve his political ends. 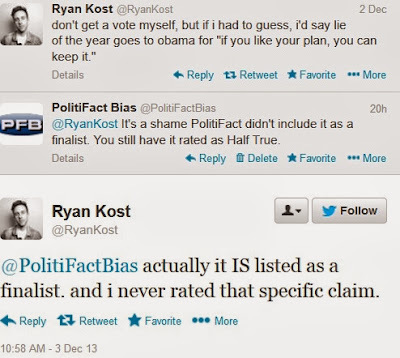 Red Alert Politics' Kelsey Osterman is right, and when one also considers the pains PolitiFact undertook to link President Obama's "If you like it" promise to his later "What we said was" explanation, the magnitude of PolitiFact's deceitfulness starts to show clearly.